Medium-sized, slightly long male of excellent type; Good coat and color; Strong bones;. Good sexual type; good stop;. Muzzle filled with enough jaw; Medium brown, almond-shaped eyes; Undulating, well-set ears; long Prop and dry throat; Arched chest with enough forechest; Well placed elbows; Parallel foreleg position; Straight sloping back line with some minor withers; Slightly sloping croup; Well set tail; Angulated in both knee and hock; Parallel hind limb position; Parallel movements from behind, narrow front; elbows slightly twisted outward; Firm back; Firm wrists; Ground covering, smooth and efficient movement. Ti+3 Kj+1 Ks+3 T+1 S+1 F+1 N+1 H+3 D+2 Korad +2 (166p). Judge: Göte Roman o Benny Svanstedt, Borås. Cäsar von der Klingenstadt came from the same combination that produced the influential von der Weyermühle “A” litter (Amor, Arco, Asko, Anouk, Alfa). He was exported to Finland where he gained his Schutzhund III title and passed the Swedish Körung. 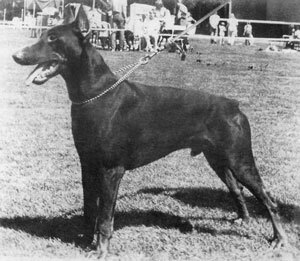 His litter-sister, Cleopatra von der Klingenstadt, was dam of the von der Klingenstadt “I, K, L” litters (Ijanko, Kira) and his sister from a repeat breeding, Anja von der Klingenstadt, was dam of the vom Geronatal “A, B, C” litters (Argus). Amatzon: IPO3, HK 3, JK 3 and 1992 Finnish All Breeds Working Champion. He is sire of Doberwache's “A” litter (Amatzon, Afra, Alfa, Anke). Black Zakri: VK 3, HK 3 and FIN KVA. Diva: dam of Cäsarborg's Black Zenn (IDC-WM participant in 1996). Jaik-Joonatan: IPO 3 and sire of Cäsarborg's Black Zenn. Fabian Filur: Swedish Tracking Champion, Swedish Obedience Champion, Swedish Sledge Pulling Champion and passed the Swedish Körung with highest markings. He is sire of Briska's “F” litter (Jaren). Frigga Futura: dam of Briska's “G” litter (Grace).